Experience the “jaunt” one town – one treasure – at a time. When someone says, “Sand hills Journey Scenic Byway”, what comes to mind? Perhaps, sand – and lots of it – or perhaps nasty sand burrs the size of your thumb? A three-day visit to the sand hills of central Nebraska was never at the top of my bucket list and definitely not somewhere I wanted to celebrate our 30 wedding anniversary. Tami Pistillo on her 2013 Junk Jaunt adventure. 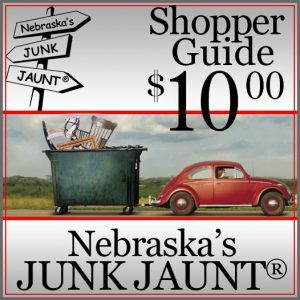 September 2013 marks the 10th year for the unique shopping experience of Nebraska’s Junk Jaunt. The “Jaunt” is an enormous garage sale/flea market following a 300 mile loop in central Nebraska. It is a “pickers” dream. Imagine descending on the sand hills with 300 miles of garage sales, antique and flea markets as far as the eye can behold. With our Junk Jaunt map and shopping guide in hand, we embarked on a journey that will be long remembered. One never travels the “loop” and returns quite the same. There is a little bit of picker in all of us – whether we admit it or not. 300 miles of open highways and gravel roads does something for the soul. Our adventure began in Grand Island, traveling on Highway 2 to Cairo – our first stop. Quickly “breaking the ice” I pulled my treasure from a trash box – paying for my two dollar hanger, I was on my way to a picker’s paradise for the next 223 miles. I consider myself a “novice” when it comes to treasure seeking. We shared the road with hundreds of other novices, just as ourselves and definitely many seasoned shoppers, towing long trailers stacked high with precious treasures and cargo from another era. We began our second day from Thedford, NE. The morning temperature was a brisk 42 degrees. On our first stop of the morning in Brewster – I found a winter scarf for a mere twenty-five cents. Walking from the sale barn, I was thankful for divine providence delivering me from the cold and promptly trudged into a thick patch of cacti. My sandaled feet were no match for the spiny cockle burrs. No matter, I was on to the next shopping opportunity. A doily, a steer’s skull and vertebrae for the cabin garden, a rusty metal wagon wheel, an out of print book by Taylor Caldwell, a candy dish – what more could a picker ask for? Certainly, there were many fine antiques and collectibles. I left those items behind, running to the next town filled with treasures and yes – delectables. In Taylor, we purchased fresh Kolaches in the living room of a work colleague I hadn’t seen in year. 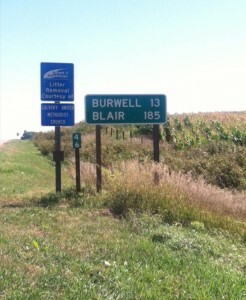 As we bid farewell to Taylor, a road sign pointed the way to Blair, NE; only 185 miles. But, home would not be on our itinerary for a day or two. The 300 mile long yard sale in central Nebraska drew in tens of thousands of people from around the country. Officials say shoppers came out from at least 34 states to attend the event. I have thought of this shopping extravaganza several times since our return home. What is it that still calls me? Perhaps it is a sock monkey long forgotten, or the wool quilt made from cloth scraps or perhaps the jewel tea bowls remembered from grandmother’s kitchen. Join the “jaunt” – Nebraska’s 2014 Junk Jaunt will be waiting for you next September. You too – can find that special treasure. Tami Pistillo and her family of 5 are from Omaha, NE. MY husband Tony has worked for Werner Enterprises almost 30 years and I am employed for First Data 20+ years. Both jobs require a great deal of energy. We are also priesthood ministers within the Community of Christ. The Junk Jaunt is the perfect outlet for us. 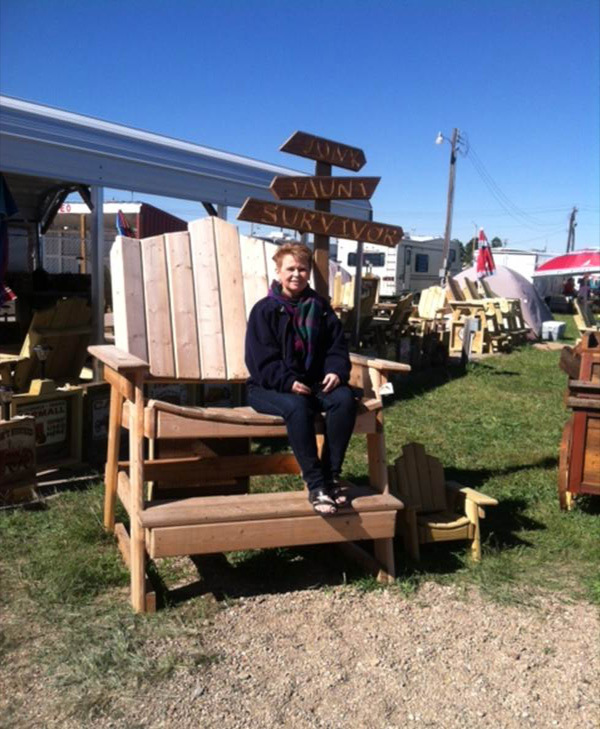 The fellow sojourners and vendors we met during the “Jaunt” were precious treasures.